The SEMA show is now open, and for Mazda that means one thing: we get a much better look at those two sweet Miata concepts that the automaker gave us a sneak peek of before the show started. The answer was yes. The team took out what remained under the dashboard, replaced the gauges with a digital display, swapped the Brembo brakes for the lighter spec Miata Sport and Grand Touring brakes, and replaced the stock 25.1-pound battery with a Braille GreenLite G20 Lithium battery, which weighs only 4.5 pounds. All in all, an additional 100 pounds were lifted from the Speedster, earning it the new title of the Speedster Evolution, as well as a White Ether paint job. 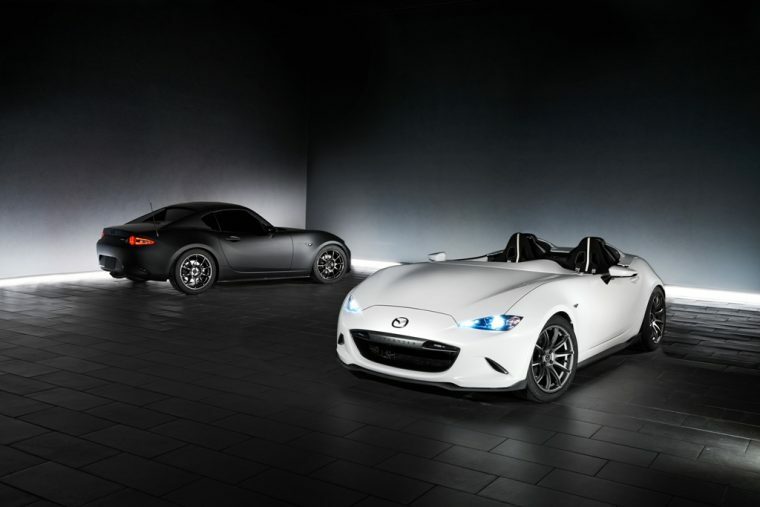 The second concept, the MX-5 RF Kuro, unfortunately does not have the same story behind its development, as it was designed as a sleek, slinky version of the upcoming MX-5 RF. The Kuro concept is equipped with much of the MX-5 Global Cup technology, including its adjustable suspension and Brembo dual-piston front brake calipers. It is painted the semi-matte black metallic color that gave it its name (“kuro” means “charcoal” in Japanese). Both vehicles were made from parts available for purchase via MazdaMotorsports.com, and will be on display until the 4th.